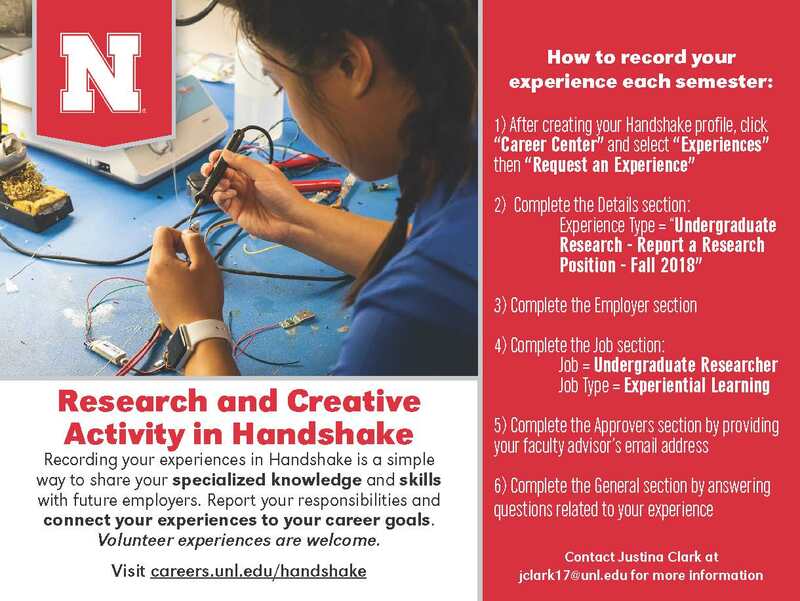 Students can now record research and creative activity experiences in Handshake, the career platform utilized by the University of Nebraska-Lincoln, making it possible for you to showcase the specialized knowledge and skills you’ve gained in your experience to future employers. You can connect your research or creative activity to your career goals and record all your experiences — paid, volunteer, or through a program like UCARE — in one place. Your faculty mentor will confirm your participation in the experience and you’ll record your current experiences each semester. Take advantage of the robust Handshake platform and set yourself apart to future employers. Why should you use Handshake? Record all your experiences in one place. Add your experiences each semester as they occur so you don’t forget any crucial details about your experience. Volunteer experiences are often a student’s first foray into research or creative activity. Record these valuable volunteer experiences by adding them to your Handshake profile. Start by visiting http://careers.unl.edu/handshake to join Handshake and complete your profile. If you have questions about recording your research or creative activity experiences, contact Justina Clark at jclark17@unl.edu.